Costa Cruises has selected an Italian travel agent from Palermo, Carolina Miceli, to be godmother for the Costa Diadema. She was selected from more than 700 women travel agents from more than 50 different countries. Costa said that the Italian travel agent was chosen, because she represents Costas' values, such as her positive attitude and passionate work at her agency, Tagliavia. 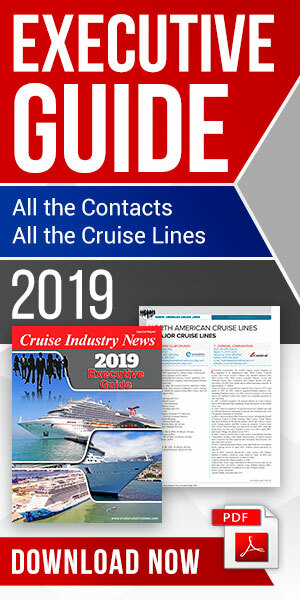 “As a travel agent she has become a true ambassador of Costa Cruises, offering the best cruise holidays to her clients,” the cruise line said in a prepared statement. The Diadema will be christened in Genoa on Nov. 7. The new ship will spend in the winter season in the Mediterranean Sea. From Nov. 8 until the end of 2015 summer season, she will sail seven-day cruises from Savona, calling at Marseille, Barcelona, Palma de Mallorca, Naples and La Spezia. Photo: Norbert Stiekema, executive vice president, sales and marketing for Costa Crociere, and Costa Diadema godmother Carolina Miceli.